Flow Factor is your source for Solenoid Valves, Control Valves, Coaxial Valves, Solid State, Mechanical, and Explosion-Proof Pressure Switches, Transducers, Jet Pumps (Eductors), Temperature Switches, Level Controls, Transmitters, Recirculating Pumps, and Instantaneous Hot Water Heaters. Carlo Gavazzi offers a comprehensive range of digital panel meters, HMIs and digital displays (current meters, ammeters, voltmeters, frequency meters, temperature meters and temperature controllers, tachometers, and rate meters) for the OEM, Panel Builder, Instrumentation, and MRO customer. 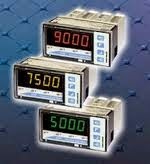 Covering most input types (current/voltage/temperature/resistance/RPM), Gavazzi digital panel meters are well suited for your display requirements. The Carlo Gavazzi UDM40 series is a hi-tech modular panel meter developed to meet advanced application needs. The Gavazzi UDM40 series Features a 4 digit display. The meter front is rated at IP67, NEMA12, NEMA 4X for indoor use only. Input Power outages are 90-260 AC/DC, 18-60 AC/DC and 10-28v DC. The Gavazzi UDM40 series accepts most signal inputs (current, voltage, temperature, tach) and offers an analogue output as well as up to 4 digital outputs (relay). Since these are modular meters, outputs can be added at any time in the field. Remote monitoring via a PLC or PC is possible by inserting an RS485 communication module into the meter. In this way many meters can be monitored without adding a lot of expensive analogue cards to your PLC. The Carlo Gavazzi UDM40 meter also features a 3-color display allowing at a glance indication of relative operating condition (OK - Green, Caution - Yellow, or Alarm - Red). Furthermore, the UDM40 is also able to handle and correctly display non-linear signals. Temperature inputs are Thermocouple types J,K,S,T and E and RTD resistance detectors. Relay outputs are up to 8 amps up to 240 volts single phase. The analog outputs are 0-20mA or 0-10v DC. The UDM40 Agency approvals are CE, cCSA, UL, e cRU. For more information please CONTACT Flow Factor. Whether you have to manage temperature, flow, valve positioning or pressure, the Chromalox 40 Series Temperature and Process Controllers provide you with a comprehensive feature list and the flexibility to meet your most demanding process and temperature needs. Application needs change over time, but that doesn't mean that you'll need to change your controller. The Chromalox 40 series modular card design provides the owner with the flexibility to alter the functionality with ease. Expansion from 1 to 3 outputs, as well as communications and remote setpoint is easily accomplished and automatically recognized by the firmware. The optional ChromaWareTM configuration software allows the owner to program multiple units efficiently and store parameter settings for later use. For Controllers with 120/240 AC volt input control voltage Click Here. For Controllers with 24 Volt AC/DC, 24vac or 24vdc control voltage click Here.